Angelic Heel Returning to you…. Welcome to yet another night of MONDAY NIGHT ROLLINS! Yes indeed the WWE returned to our nation’s capital with a bang as Raw kicked off the air. It was a night where the WWE Universe got to witness first hand the generosity of WWE Champion Seth Rollins, the dismantling of his former business associates and much much more that would continue to lead us on the path to Battleground. Did you miss this exciting show? No Worries, as always I’ve got you covered. Find out what happened now!! The night began on a high note as our beloved WWE World Heavyweight Champion graced the WWE universe with his presence. And by his side, Kane and J & J Security. Once in the ring Rollins gave credit where it was due to his Authority brothers and all their hard work and dedication to keeping him champion. Even giving Jamie Noble special applause for sustaining 3 broken ribs in the last encounter with the Beast, Brock Lesnar. As a symbol of his thanks, Seth gifted the three other men with Apple watches. But his generosity knew no bounds as he then gave the gift of a vacation to Hawaii to the director of operations. But the gifts kept on coming from the Champ as he then stated that the main event of the evening would be himself and Kane vs Dean Ambrose and Roman Reigns. Seth then stated that he witnessed a travesty. Jamie Noble and Joey Mercury arriving in a crappy rental car. This was an issue he quickly rectified as he bestowed upon them a fully loaded Cadillac. Thankfully this match was over quickly. It began with Mark Henry getting in a few good licks but ended when the Big Show landed a knock out punch putting the World’s strongest man flat on his back. Best part of this match was the Miz on commentary. But while the match was over, that did not stop Ryback from making his presence felt as he came down to the ring and attacked the Big Show for no reason. This brought the Miz out from his place at the announce desk as he landed a big boot that put the Big Guy down before bounding from the ring to safety. This hit and run attach infuriated Ryback and demanded that the match that was slated for later in the evening between himself and the Hollywood A Lister, take place right then and there. The Miz declined but things did not go as he wished as we found him in a place he did not want to be. The most exciting part of a Mark Henry vs Big Show match was the commentary provided by the Miz. His enthusiastic glee at watching Mark Henry attempt to lay a beating on the big Show was quite humorous. No idea why Ryback felt the need to interject himself at the end but he why not? Crazier things have happened. But it got him a boot to the face so it may not have been the most brilliant of ideas. Ryback got his wish and he and the Miz went one on one. The Miz attempted to use his speed and quick feet to keep the Hungriest Man in the WWE at a safe distance, however it did not go as intended as he was caught and then muscled about the ring as if he weight nothing. The Miz however was able to get in some of his signature offence but it didn’t last long nor was Ryback dazed for an extended period of time. In fact Ryback showed off his strength by keeping the Miz held in the air before suplexing him into next week. Ryback caught the win over the movie star and celebrated with hsi Intercontinental belt. So one might think that the Miz is totally out of his depth in a match against both Ryback and the Big Show. Sure both men are bigger and stronger than he is, and both have destroyed him in one on one matches, but the Miz is the type to thrive on such adversity. I wouldn’t be surprised if he walked out of Battleground with the IC title. In her on going struggle against the Bella Empire, Paige took on Alicia Fox. These two ladies tore down the house in a Diva’s match that was intense and extremely fun to watch. The English Diva dominated Foxy for a most of the match, but Alicia used her skills to weather the storm and fight back. On a few occasions she used Nikki and Brie to her advantage but it was nothing that the former Diva’s champion couldn’t handle. Even though she was out their alone, Paige showed her superior abilities as she reversed Alicia’s roll up into a roll up of her own to lock in a win. So once again, spot light whore… I Mean United States Champion, John Cena issues his open challenge. The whole want some come get some speel, but at least he got right down to business vs spending 5 minutes blah blahing. And who would accept? Why NXT Champion Kevin Owens!! Just as the match was about to get started though, Owens rolled out to the floor, and told the WWE Universe that on second thought, he would save this fight for Battleground, but that another man wanted a shot at the title. And out pops the Swiss superman, Cesaro! The match between Cesaro and the face that thinks it runs the place was an insane match that took both competitors to the limits. Cesaro took the fight right to Cena and used his arsenal to wear down the champion. John returned each move blow for blow and used some interesting and innovative moves in an attempt to secure the victory. The two fought bitterly and it appeared that Cesaro might secure the victory until Kevin Owens, who had been sitting doing commentary, rushed the ring and attacked Cesaro as he had the United States Champion locked in the Sharp Shooter (Tyson would be so proud. GET BETTER TYSON WE MISS YOU!!). This gave the win but not the title to Cesaro via DQ. The NXT Champion then delivered pop up powerbombs to both men and declared that if ANYONE took the title from Cena, it would be him. This match was up there for match of the night. I have never said that John Cena can’t wrestle and that’s because, contrary to popular belief, he can. Put him in the ring with a talent like Cesaro and you have gold that kept the WWE Universe wanting more. By the end of the match, I doubt anyone (but me, can’t say as there is any time I want to see Cena win… just sayin) cared who won the match. If Owens has a pop up powerbomb, Cesaro has perfected the pop up European upper cut. The air that Cena caught would give him frequent flier miles. The intensity that these men brought out of each other electrified everyone around them. I did get a kick out of the end of the match. Kevin Owens is one hell of a guy and I approve of his brutality to both men. I see a United States Championship hanging on his shoulder soon. As positive as the New Day and their Inspirational partner are, their number is still owned by the Prime Time Players and whom ever they are teaming with. The match was a speedy slug fest filled with high flying and bodies being tossed around like they were nothing, (Titus, I’m looking at you big boy!) But That isn’t to say that the New Day and Bo Dallas were push overs. They were far from it. For a good portion of the match they held offensive momentum by isolating Darren Young from his corner and his partners. But a little miscommunication and some lucky hits allowed Mr. No Days Off to make the tag that would eventually swing the tides in favor of the Tag Team Champions and the Lucha Dragons. Team work and the power of the Clash of the Titus (yes I might have had to look up the move’s name… Don’t judge, who of you knew what it was called?) and the victory went to The Prime Time Players and the Lucha Dragons. This was a fun match. And I love Xavier Woods. Don’t hate, the man cracks me up. Always smack talking, well… talking in general. The other day he was snapping photographs. He just makes me giggle. I love watching the Lucha Dragons, I honestly don’t think there is a team on the main roster that works as well together as Kalisto and Sin Cara. Well maybe Tyson and Cesaro, but they won’t be a team again for at least 14 months. Bo Dallas joining with the New Day just makes so much since it’s not funny. He spreads a similar message of inspiration and positivity. This was a match made in the Divine Squared Circle. I am interested to see how it plays out in the future. So Lana and Dolph came out to say what we already knew. We aren’t stupid. The WWE universe KNOWS that they are an item. Why waist our time telling us this and rubbing it in poor Rusev’s face. Well it back fired and The Bulgarian Brute came out and was followed by Summer Rae. Rusev then describe Lana with a few choice words and stated that he never cared for her. Dolph stepped, having heard enough, and stated that Rusev could not speak to his girl friend like that and if Rusev continued… Well then Rusev would have his other good leg injured. Rusev ended up leaving the ring. It appeared Summer would follow but she hesitated. She picked up a microphone and then tore Lana a new one verbally. Calling her a gold digger and such, and stated how she had abandoned Rusev when he needed her the most. It must have struck a chord with the Ravishing Russian as she violently attacked Summer for no reason and had to have Dolph pull her off of the other Diva. Things just got real. How fun is this? Okay sure, we all knew Dolph and Lana were an item, but this thing with Summer has the potential to explode into a proper female feud. Now… Here’s the thing. I can’t stand Summer Rae. I don’t like her. Her in ring ability makes me cringe and I’d much rather listen to John Cena talk than watch a Summer rae match (and that should tell you something…) Lana on the other hand, I’ve never seen her in the ring so it’s like I get to unwrap a present on Monday at a time. It almost feels like Christmas! Let’s get it on!!! It was not the first time these two men have faced each other in the ring. Nor do I think it will be the last. This is one of those matches that pairs speed and agility against size and power. This time, power won. But not with out a battle. Neville controlled a good portion of the beginning of this match and forced Sheamus to regroup out side the ring. But this breather was exactly what Sheamus needed to begin to build momentum in destroying the High Flier. The Celtic Warrior landed many moves that took the wind out of Neville’s sails. The Irish Curse back breakers were particularly devastating. Apparently one can’t fly around the ring if their back is rebelling in pain. One Brogue Kick later and Sheamus proved that size and strength over comes the silly hopes of an under dog like Neville. As stated above, I doubt this is the last time these two men meet in the ring. They are good together and bring out the best in one another. Their styles contrast beautifully and it creates a work of art in the match. One is never sure what kinda stuff Neville will pop off with, and Sheamus’ brutality is refreshing. Of course, the Celtic Warrior does hold that briefcase. Though considering who is champion, I don’t see that ending well for him. Such a fast match. Jack Swagger, the WWE’s resident jobber when Zack Ryder is busy, was fed to the King. Sure he got in a few good licks, but it was Barrett who came out on top with a Royal Bull Hammer for the Victory. Not much to be said here. I see Jack Swagger on the TV, I’m expecting him to be pinned and that is exactly what happened. Nuff Said. And now it’s time for the main event of the evening. Our beloved WWE World Heavyweight Champion and Undisputed Future of the WWE, Seth Rollins, teamed up with the Director of Operations and Authority brother, Kane, to dismantle and destroy Rollins’ former Shield business partners, Dean Ambrose and Roman Reigns. The stipulation, no disqualification. Oh this promised to be amazing. This match delivered as it began in chaos as both teams tore into one another. Eventually order was restored and a tag team match began out of the brawl that had begun. The Authority fought hard against the disrespectful Reigns and Ambrose in every attempt to put them in their place. But the Power house and the Lunatic Fringe don’t know how to remain put down as both were able to gain the upper hand. Just as it appeared that Roman Reigns was about to do the unthinkable after he landed Superman Punches on all of the Authority members, including the Champion, Bray Wyatt sprang out from the shadows to halt that train on the tracks. He derailed Roman’s momentum and put him down. Officials forced the new face of fear back to the back and the match continued. This left Dean Ambrose in the ring alone to face the consequences of his actions. one pedigree later and hit shoulders were pinned to the mat. But Seth was far from over in his punishment to the man who stole his title belt. 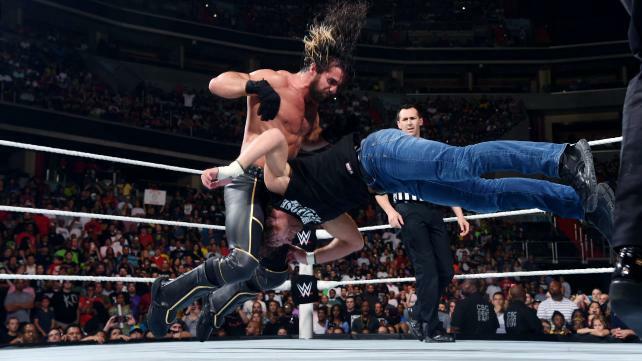 Rollins intended to put Ambrose through a table with the move that the Shield made famous, the Triple Powerbomb. But alas, justice was not served as Roman Reigns recovered and saved his brother in arms. But the numbers game that the Shield had perfected, came into play and he was over taken and put through the table that had been intended for Dean. Just when it appeared it could not get any worse for Reigns, Wyatt returned to the scene of destruction and dealt out some punishment of his own in the form of a Sister Abigail. Oh how sweet it is to exercise the power that comes from being on top. Seth Rollins was on fire! He is the Architect. He has the best plans and knows exactly what to do in any situation. This match was brutal and difficult to watch, if you are an Ambrose and Reigns fan. Sure the two men got in some decent offence but the righteousness of the Authority always ring true. This ladies and gentlemen is what happens when you step up against those in power. Remember, the Authority ALWAYS wins. This entry was posted on Wednesday, July 1st, 2015 at 9:36 pm	and is filed under Events, News, Television. You can follow any responses to this entry through the RSS 2.0 feed. You can skip to the end and leave a response. Pinging is currently not allowed. « Robert Downey, Jr. Entering Live-Action Fairy Tale World!! !